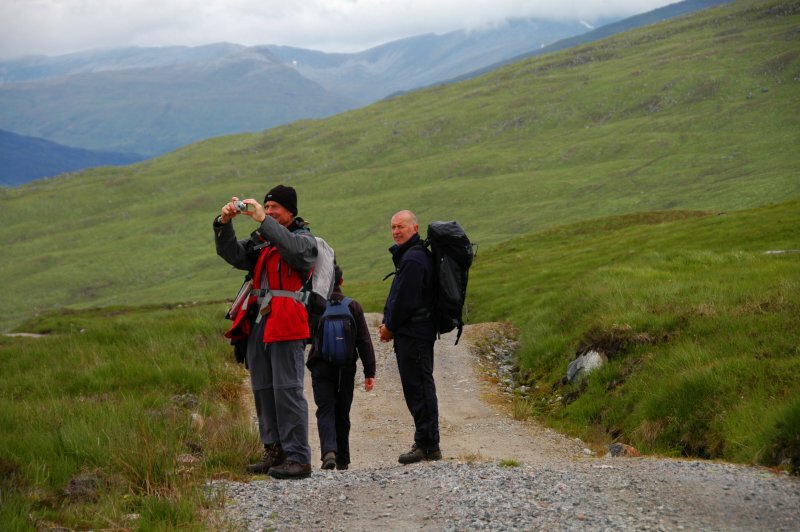 Bagging Munros near Loch Ossian 19th – 23rd June 2012. 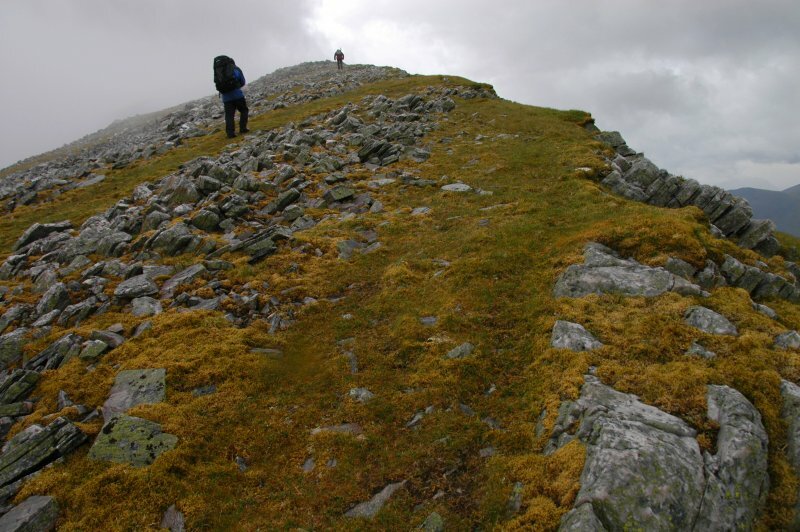 Part 3 – Stob Coire Easain proves quite a climb, preceded by a 9-mile yomp there and back! We rose on Thursday, 21st June, realizing that we faced our toughest challenge yet. 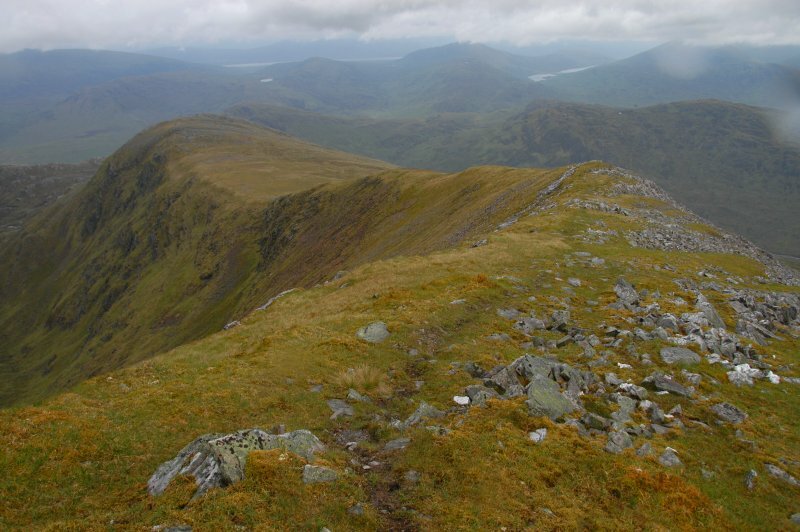 The day before, from the summits of Carn Dearg, Sgor Gaibhre & Sgor Choinnich, Tim had looked across towards some peaks to the north, one of which, Stob a’ Choire Mheadhion, sported a distinct blob of snow, we he had decided he wanted to get to. 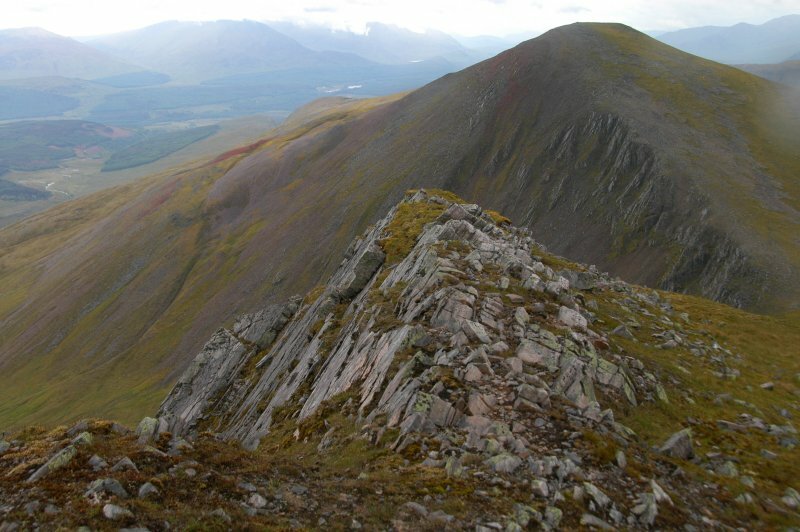 Stob Coire Easain and Stob a’ Choire Mheadhion are located on a 8 km long ridge, separated by a high col at 960 metres. The simplest way of getting to the area on foot involved a 9-mile yomp (to coin Tim’s oft-used phrase) via Loch Treig, there and back! 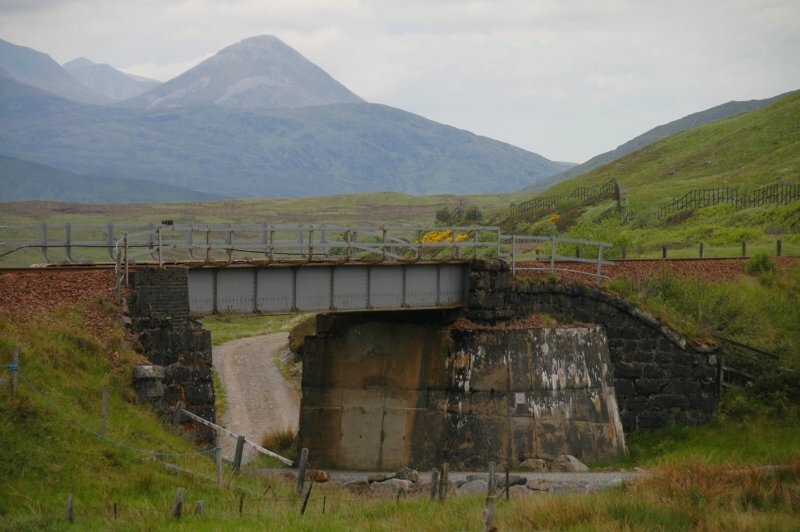 A dirt road leading from the hotel winds its way down to a tunnel under the railway line, north of Corrour Station. Passed by a land rover leaving a cloud of dust in its wake, we were thankful of the descent as we approached Loch Treig, mindful of what it meant come the day’s end. 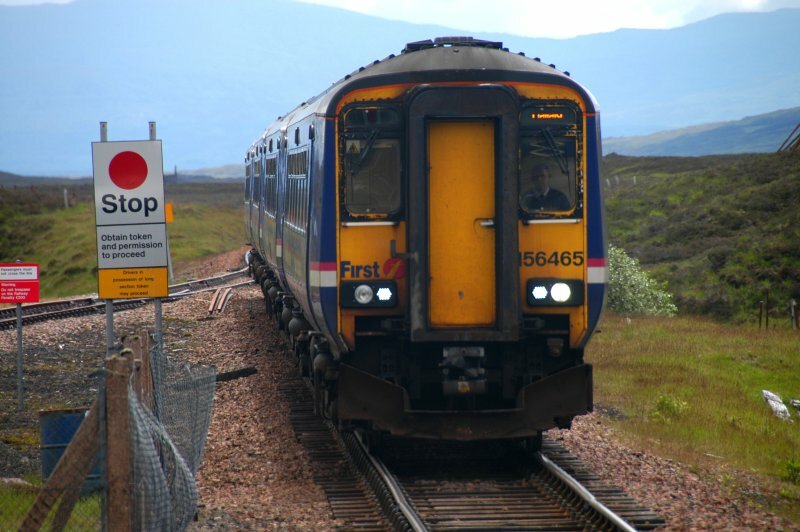 Trains passed by on the West Highland Line running parallel to but above the dirt track. We crossed a bridge where the river known as the Abhainn Rath flows into Loch Treig. 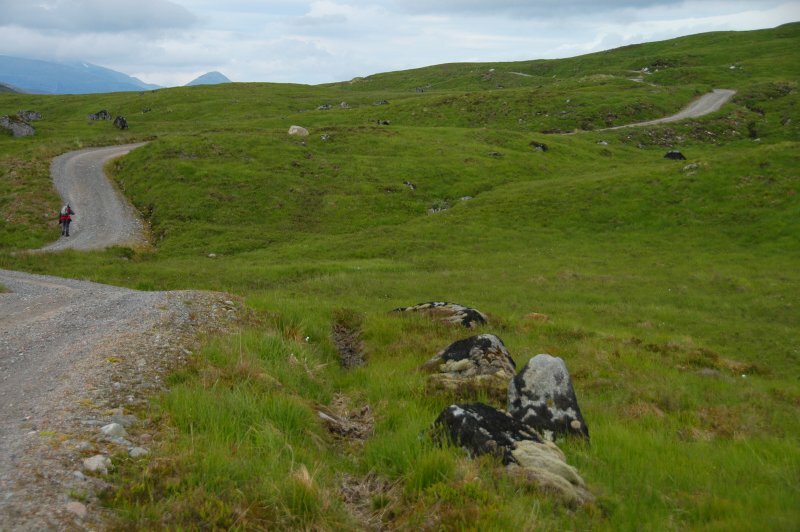 The long and winding road to Loch Treig. 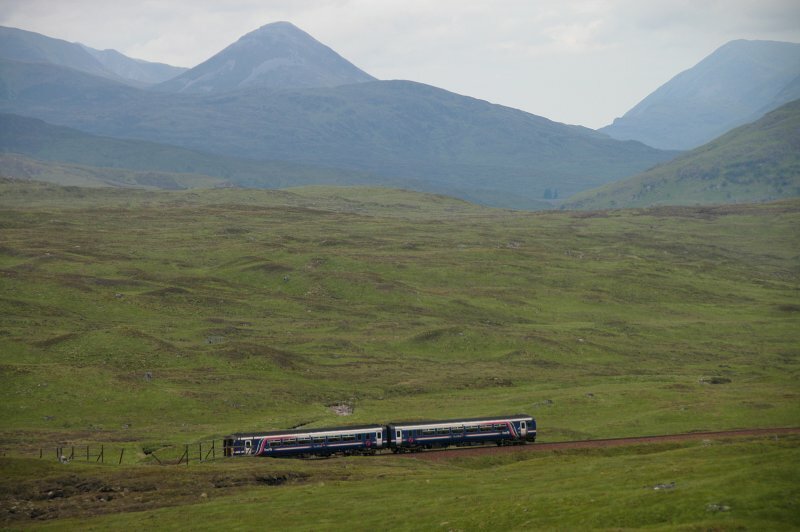 A train goes by on the west Highland line. John snapping the countryside en route to Loch Treig. Under the bridge just north of Corrour station. 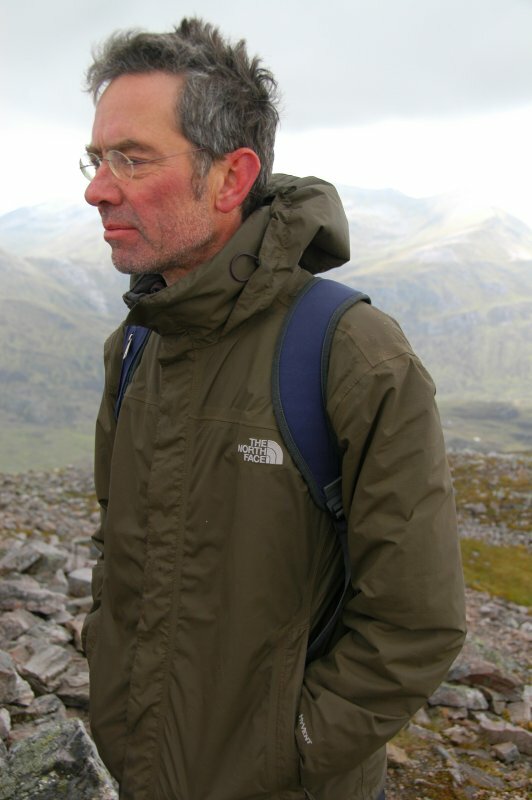 Here we encountered a clean-cut, tanned, dapper Scottish gentleman wearing a bright blue rain jacket who spends six months of the year living out his dream, fishing the waters across Rannoch Moor, come sunshine, hail snow or thunder, living in a tent! If I had passed him in the street in Fort William, I would never have guessed it. He described how he had spent a winter here, losing his way one day whilst attempting to walk along the dirt covered in metres of snow, instead falling off the edge and into the ditch! We learnt later that he had assumed almost legendary status in these parts. Heading down to Loch Treig. 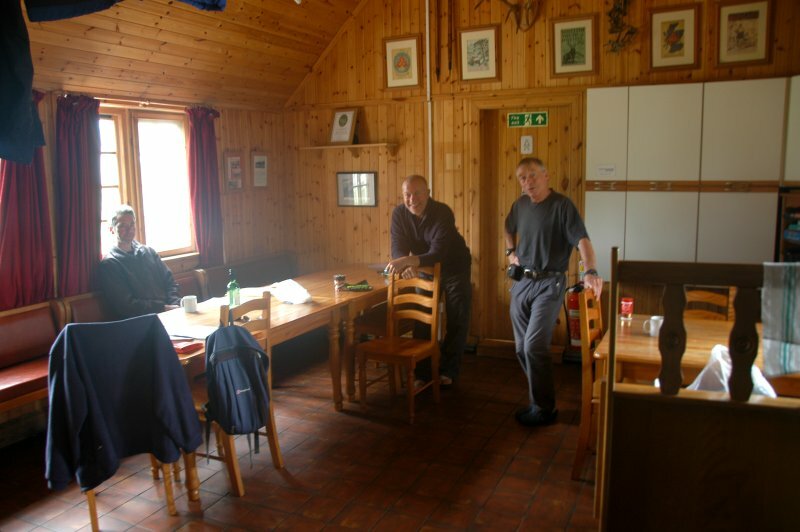 Unbelievably, on the way back, we encountered a young guy walking all of 20 miles to meet a friend at a bothy, a basic shelter, usually left unlocked and available for anyone to use free of charge, common in the highlands of Scotland. 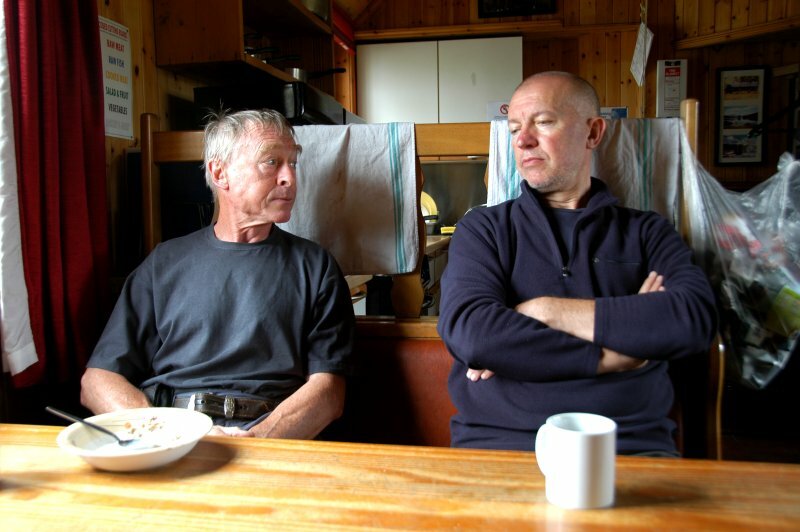 Tim and Martin had discussed the route up however some uncertainty prevailed. 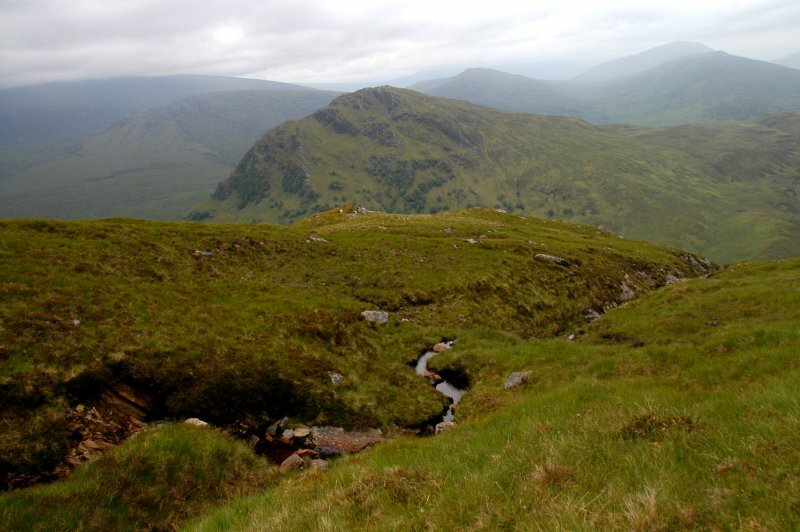 Our cult figure provided some advice and suggested we head for an abandoned house on the north side of Loch Treig and head up the valley along the Allt na Lairige, a small stream, from where we ought to find a way up to Stob Coire Easain. The slab of rock above the loch, Creagan a’ Chaise, had to be avoided at all costs. No sooner were one over it than one faced a descent into a quarry which would prove impossible to emerge from. 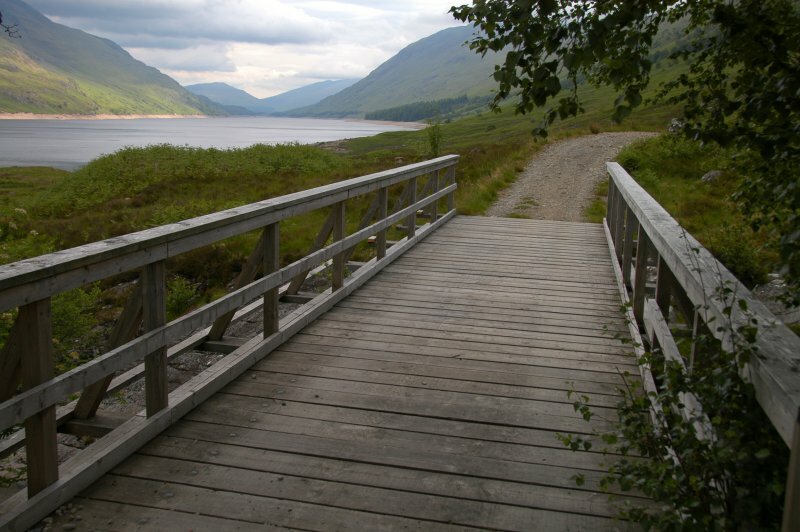 The bridge across the Abhainn Rath, which flows into Loch Treig. 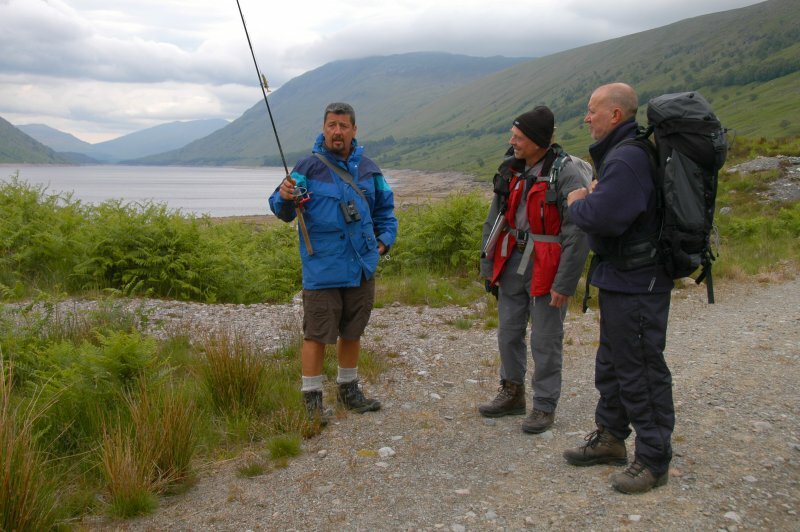 The wandering fisherman, who spends up to 6 months alone in the highlands. 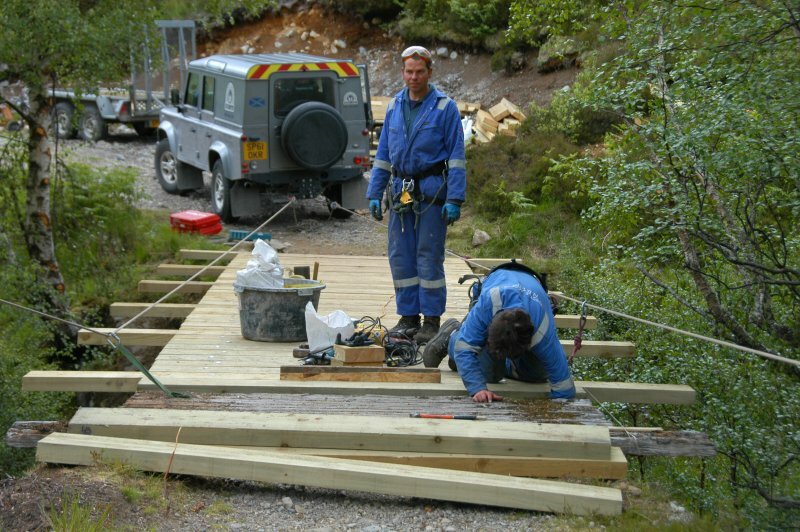 Repairing the bridge at Loch Treig. 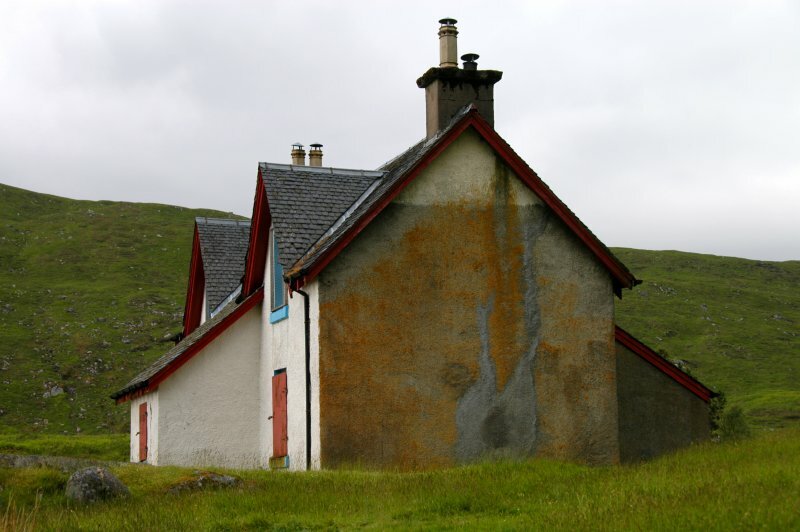 The abandoned house at Loch Treig. Following a road that appeared to lead to the abandoned inn, we then encountered the guys in the land rover repairing a wooden bridge further along, though we weren’t sure precisely why, because the unmaintained track seemed to narrow considerably, unsuitable even for 4-wheel drive vehicles. At the abandoned building, its windows boarded up, as if to lock in the secrets and tales it once held, we stopped for tea. We encountered a small footbridge with a sign warning us not to cross due to its unstable condition, which of course we did. We were to learn later that this also provide a clue as to our onward and return routes. The path we were on wasn’t obvious and we had to negotiate a steep embankment where it had collapsed. Ascending through a field of ferns above the valley of Allt na Lairige. The peak on the opposite side of the valley is only just visible. Still a long way up to Stob Coire Easain. We made our way up the right-hand side of the Allt na Lairige until we reached a bend where Tim had envisaged a possible ascent could be undertaken. The hillside was covered in ferns. It was steep and the going was tough however it eventually levelled off slightly, allowing us to look back down to the river stream. Further up the hillside, large outcrops of rock separated by grassy stretches provided some shelter from the weather, which was beginning to turn colder. We continued up to a col from where the final ascent to Stob Coire Easain was clearly visible, though the cloud seemed to drift in and out, occasionally covering the peak. 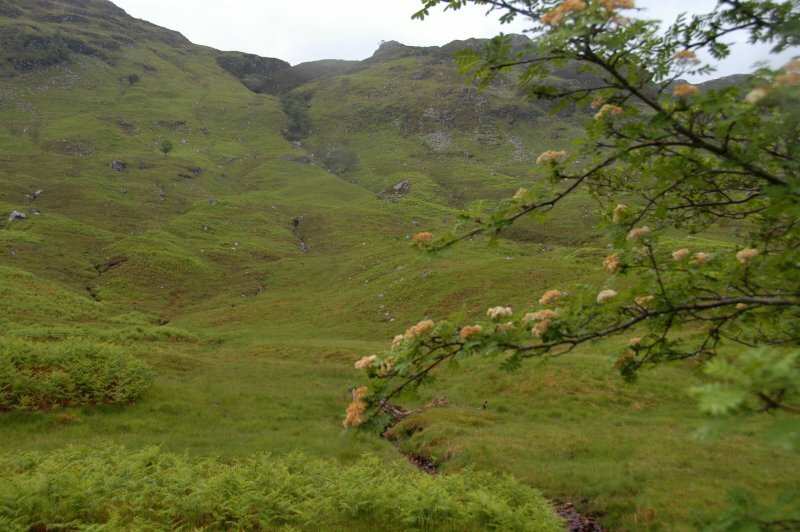 To the right, the ground dropped away sharply towards Loch Treig. Once at the 1115 metre summit, a debate ensued as to the next course of action. Two alternatives existed. One involved going back the way we had come, the other continuing on to the col and up again to Stob a’ Choire Mheadhion, at 1105 metres, before heading off down along the official access route to these two Munros, a straightforward gradually descending path along a shoulder, to the car park at Fersit, near Spean Bridge. 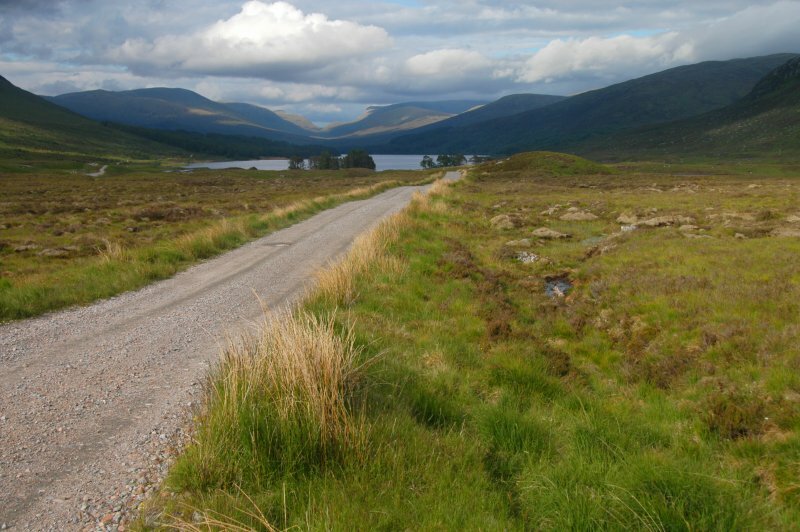 The uncertainty in the latter lay in how to get back to Loch Ossian. 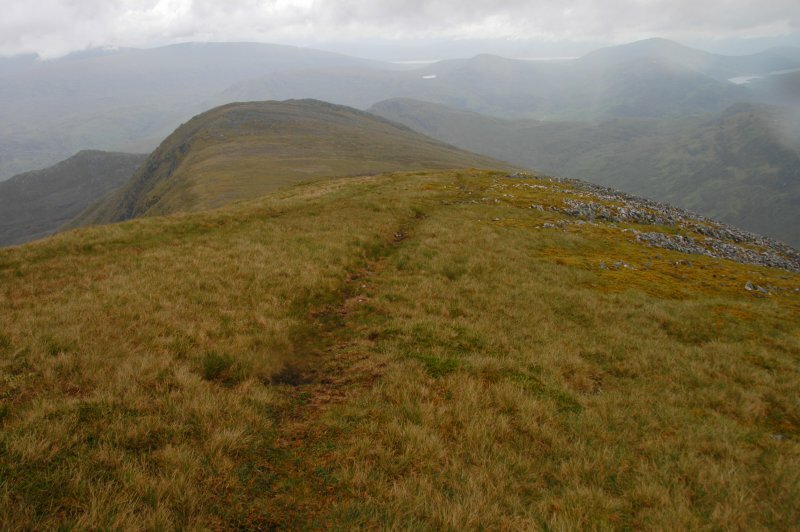 The worn path just above the col lead up to Stob Coire Easain. 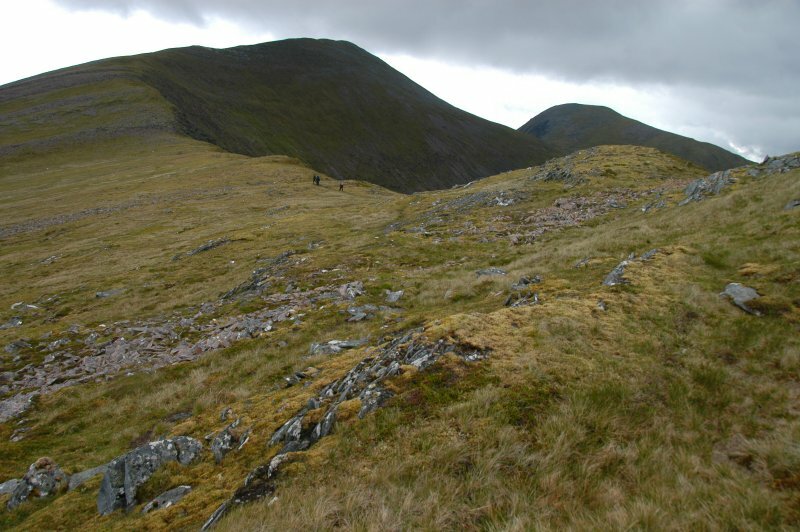 Onwards and upwards towards the summit of Stob Coire Easain. 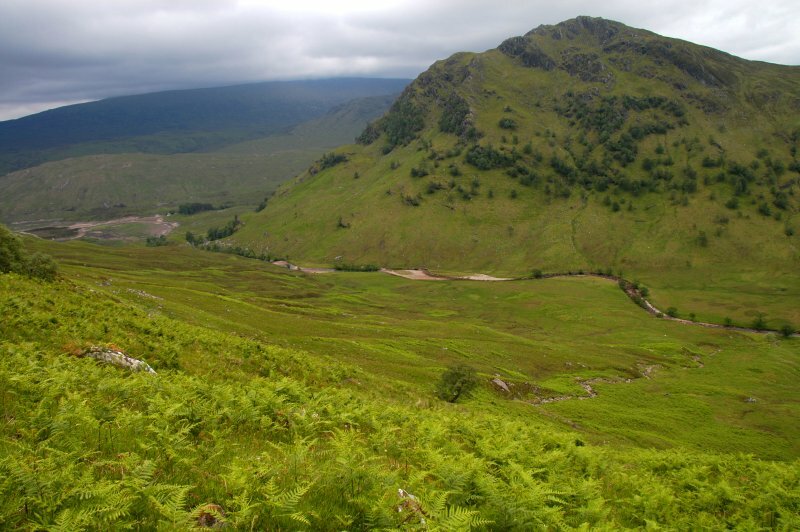 View back on the ascent of Stob Coire Easain. We chose the former option. Upon reaching the col leading up to Stob Coire Easain, we found a somewhat easier descent down the heather-clad hillside until eventually reaching the Allt na Lairige. Tim crossed the stream and then disappeared, whilst we continued downstream in an attempt to find a point to boulder hop across without falling into the water. It was then that we realised our earlier mistake. There was an obvious path back to the footbridge, which should never have been crossed in the first place, thus allowing us to have ascended that morning where we had just descended, which would have, in retrospect, made life much easier. 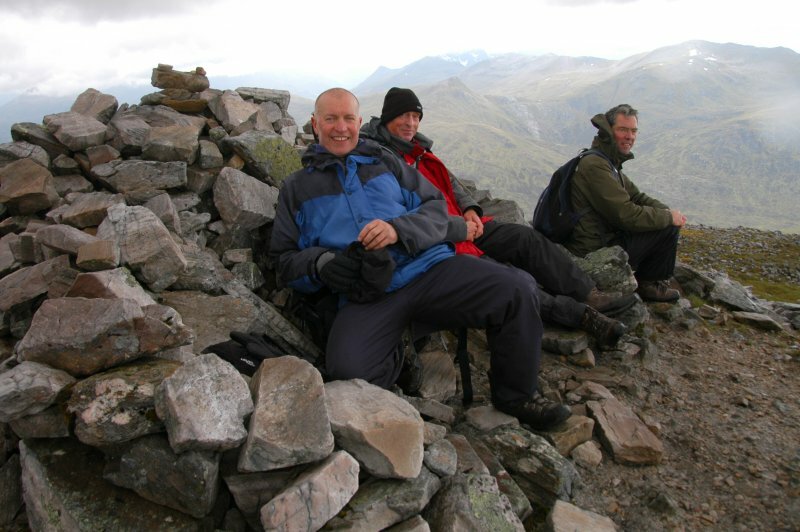 Lunching on the summit of Stob Coire Easain. 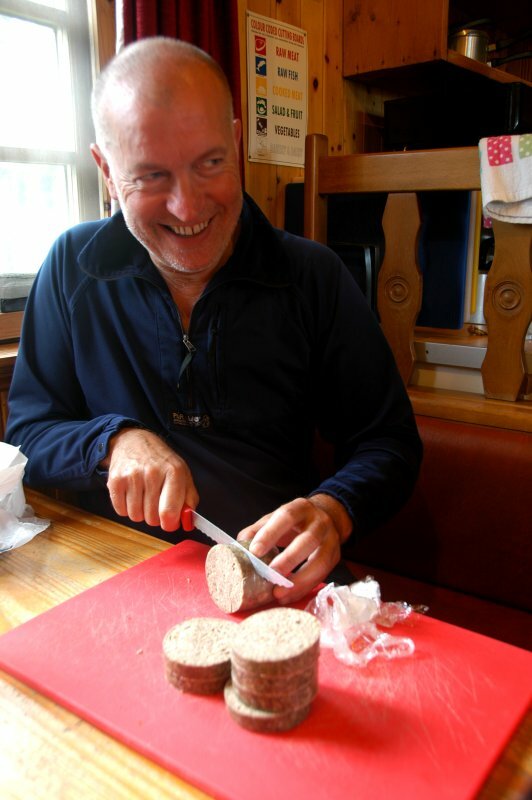 Tim’s still hungry – John West light lunches don’t fill a hollow tooth! 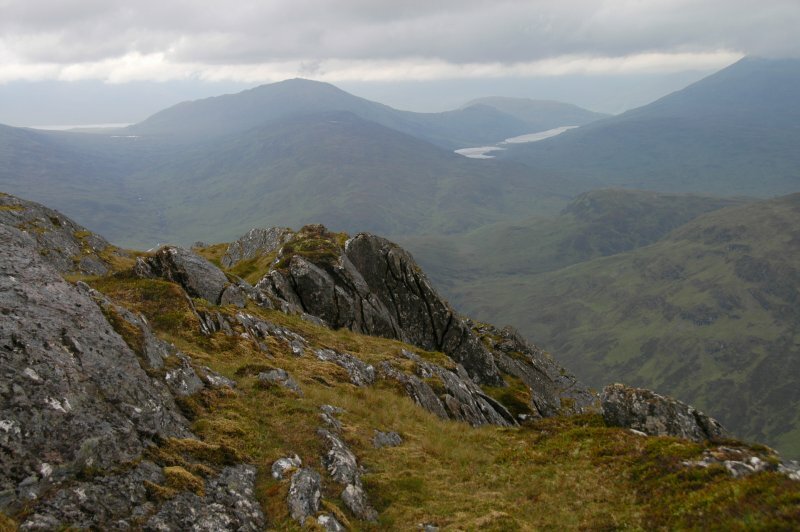 View from the summit of Stob Coire Easain towards the col that separates it from its neighbouring peak, Stob a’ Choire Mheadhion. Tim was waiting for us back at the abandoned house at Loch Treig. From here we reluctantly traipsed back the 9 miles along the road to the Ossian Hostel, eleven and a half hours after we had started out that morning. Exhausted and with drizzle setting in, I splashed about in the loch’s water. The hostel had filled up once more with a variety of walking groups and cyclists. Thankfully, Jan had managed to get the plumber in, who had replaced the pump. On the opposite side of Allt na Lairige from where we had earlier commenced our ascent. The following day, whilst John and Tim decided to venture out once more and climb the horseshoe mountain just west of Loch Ossian, starting out on the other side of the Corrour station, Martin and I opted for a more leisurely tourist activity, by taking the West Highland Line into Fort William. We returned some DVDs to the local library on behalf of Jan, our hostess at Ossian. As we sat in a pub in the town downing beer and cider and tucking into a steak and ale pie for lunch, we pondered for a moment as to whether we were missing out on a good walk however this was soon dispelled from our thoughts. We bought some haggis which we intended having for breakfast the next morning but which we ended up slicing and frying as a starter later that evening. Martin had bought some wine for Jan. 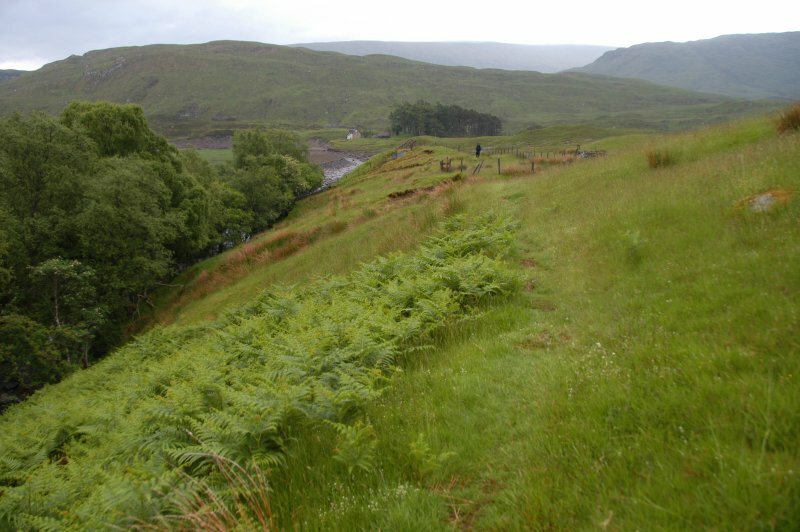 Along the Allt na Lairige, approaching the abandoned house at Loch Treig once more. Friday morning we packed early and walked the mile or so back to Corrour station. A rather shabby looking Alsation growled at us on the station platform, its owner warning us off, though John attempted to make peace by offering the hound a tasty morsel. 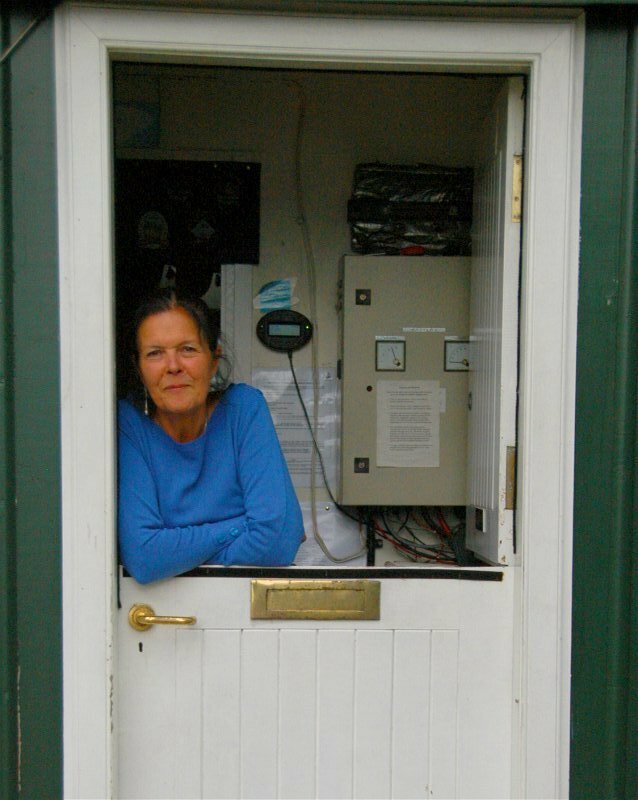 It was here too that we discovered of the identity of the Corrour Estate heiress from a path maintenance volunteer, who described how he had also been up and removed refuse collected on the summit of Ben Nevis. “Fancy a walk again tomorrow, Martin”? “Nah, John, I fancy steak and ale and a beer down my gullet”! Inside Ossian Hostel’s dining room. The train taking us to Fort William for the day rumbles in to Corrour Station. Heading south towards Glasgow on the train, we learnt of the mayhem further south. Heavy rains had caused the flooding of the West Coast railway line in England, resulting in the cancellation of train services. Our only option at Glasgow Queens Station was to jump on a train bound for Edinburgh’s Waverley Station, with an incredible amount of good fortune, we were able to grab a seat on the next East Coast train to London. The crowded train made it back to Kings Cross half an hour behind our original scheduled time of arrival. 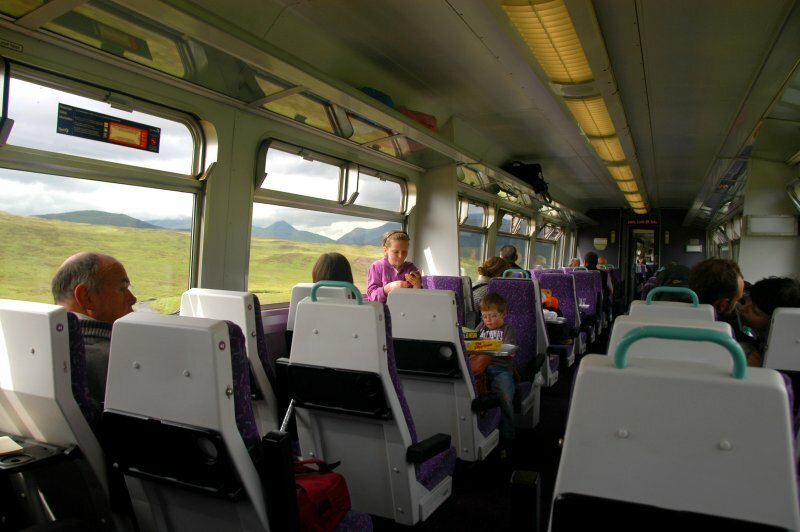 On the West Highland Line train to Fort William. 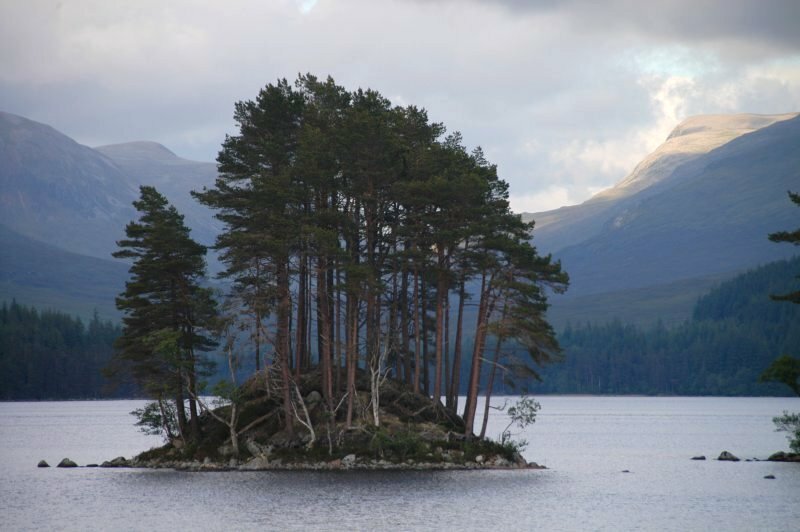 Final reminder of the beauty of Loch Ossian. Back to Ossian Hostel after a day in Fort William. 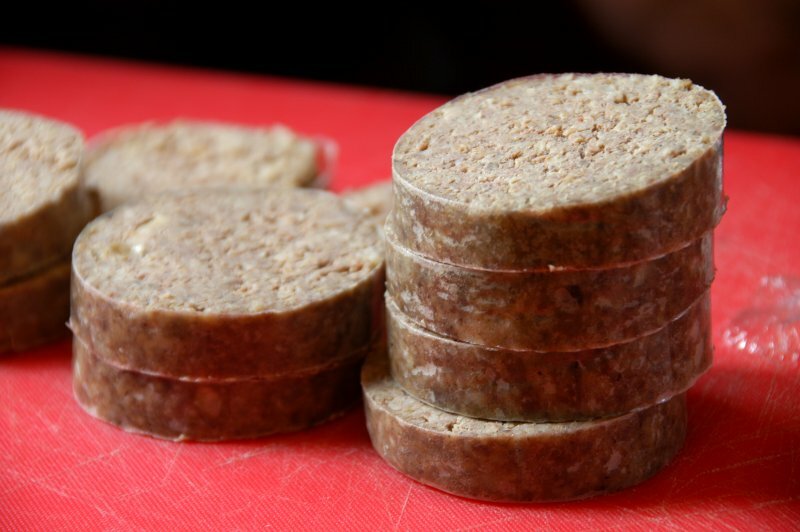 A haggis snack, sliced and ready for the frying pan! 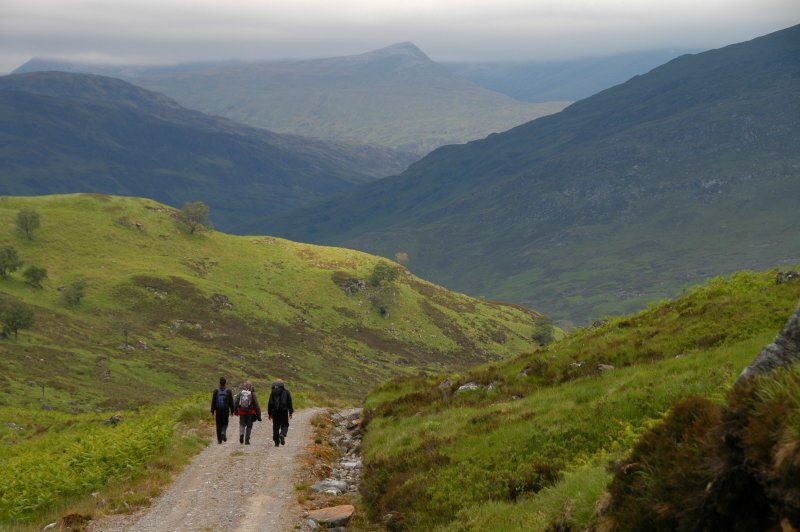 « Bagging Munros near Loch Ossian 19th – 23rd June 2012. Part 2 – Three for the price of one! Carn Dearg, Sgor Gaibhre & Sgor Choinnich.